Access is from the Turn Table carpark where there is a large carpark plus toilet facilities. From here it is a 3.2 kilometre 1 hour return trip. Sign says steep with steps. Not difficult if reasonably fit. Plenty of activity. With this in mind, I setup well away from the top observation platform but was still able to utilise a bench seat. Today’s activation was part of the VK SOTA Party. Lots of Summit to Summit Contacts – S2S pile ups at times! A staggering 30 S2S plus two VK5 Conservation Parks. All up the operational time was 3 hours & 36 minutes. WX was generally fine but with a cool southerly breeze. Higher peaks were well into the cloud. Summit Height 305 metres, good phone coverage. Another easy access (drive up) summit within an hour from home and inside the Arthurs Seat State Park. lots of good locations to operate. Summit height is 1372 metres. An easy drive up summit in AWD vehicle. Some snow still around. WX fine and sunny. My second activation of this one and part of a multi (5) summit expedition also aimed to give the Landcruiser a good run following a major service. Departing Home at 5:54 AM, I was on the summit right on 9:00 AM ready to set up. I found 40 metres quite noisy with a regular pulse but 30 metres was very quiet. Route notes from home: 07:01 AM. Fernshaw, 07:25 AM, Dom Dom Saddle 07:18 AM Narbethong, 07:32 AM Marysville, 07:43 AM Lake Mountain turn off, 07:52 AM Cumberland Junction, 08:22 AM 15 Mile, 08:31 AM Triangle Junction, 08:51 AM TJ divide. Departed the summit at 10:25 AM (00:25 hrs UTC) via the more direct track to Matlock. This was definitely 4WD only. Summit height 1464 metres. Quite slippery access and boggy at the summit. Patches of snow. I was set up near the Trig but had to wander off to a more cleared area to obtain phone coverage. I found Ian VK3TCX (SK) on VK3/VG-081 so the first contact was a 40 metre SSB S2S. This was followed by 5 CW contacts first on 30 metres and following up on 40 metres. Further S2S contacts with Allen VK3HRA with Glenn VK3YY both on VK3/VN-002 Mt. Bullfight and Scott VK2SWD on VK2/SM-001 Mt. Kosciuszko. 23 contacts all up between 0144 hrs UTC and 02:27 hrs UTC. Tried other bands without any results. Departed the Mt. Selma summit at 02:50 hrs UTC (12:50 PM). From the Mt Selma Summit Track, Turn right back onto Mt. Selma Rd. The Mt. Selma Rd Joins with South Rd at a place known as Oriental Saddle (12:59 PM). Straight ahead is South towards Mt. Useful whilst a hard turn towards to the north soon followed by another towards the south at Queen Bee Rd will eventually take you north east to the Licola Rd. A short distance past a large clearing will take you to #7 Rd where there is a side track soon to the left (south) that will allow a 4WD vehicle access all the way to the summit (01:21 PM). I found a timber post at what was possibly the highest point. The summit is broad and relatively flat. From Conner’s Plain (02:11 PM) , it is back the way I had come. (Jamieson – Licola and South Rd junction at 02:18 PM) but requiring to head south at the South Rd and Mt Selma Rd junction (02:31 PM. Mt Selma can be seen from this point. The track to Mt. Useful (02:41 PM) is due south of the summit and provides a short and easy drive to the tower (02:50 PM). 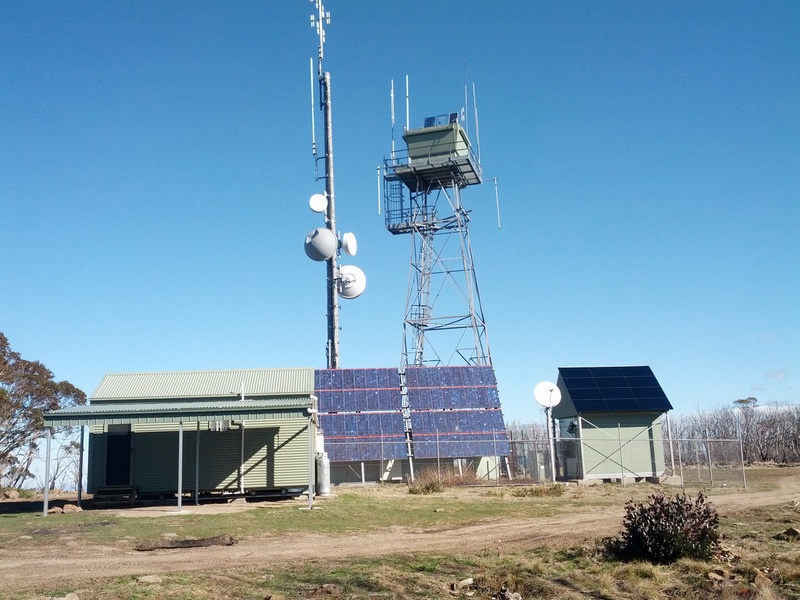 I had a look around the summit before setting up in order to find a quiet location plus see what the phone coverage was. The result was that it really didn’t matter so I set up not too far from the tower. Seeing Allen was on 40 metres CW, I picked him up then moved just a little down the band and slowly other chasers found me. This is where the RBN network comes into its own! I had heard that there had been trees down on Williamson Spur Rd so I was keen to tackle it in daylight incase I needed the chainsaw. There were 11 trees in all but I was able to drive under, over and around all of them – being in a high clearance 4WD. The Summit is located on a short 4WD track off Army Tk and just south of the intersection with Williamson Spur Rd. This junction would be in the activation zone but, being pedantic, I went to the top – less chance of interfering with other road users! My aim for this activation was to work Long Path EU DX so I took some bearings and set up the antenna to best favour the South East path. The track doesn’t go much further than this! Back to McEvoy’s Tk, Springs Rd (05:47 PM), Fulton’s Tk (05:52 PM), TR Binns Rd (05:56 PM). Dinner consisting of some pasta, an apple and coffee on Binns Rd near the junction of the Walhalla Rd at 06:36 PM – it is now pitch black! Walhalla (06:50) Bitumen – unlock centre diff. Erica (07:10 PM) – did the direct gravel rd rather than going through Rawson. This used to be the main way into Walhalla 30 years ago. From here to home via Moe is about 2.25 hours depending on traffic. The travel times should be used as a guide only. With the exception of summit access to Conners Plain and MT. Selma, all summits would have been accessible in 2WD with good clearance providing careful driving. Always drive to the conditions. These roads are very isolated and can easily become impassable from adverse weather, snow and fallen trees. The roads can be rough, pot holded, corrugated, slippery (wet and loose gravel on corners). Phone coverage is limited. There is always the possibility of meeting on-coming traffic including motorcycles. Deer shooters are common too! The route is pretty much all un-made roads from Cumberland Junction to Walhalla. Good maps and / or local knowledge are essential as your proposed route may not be open and many tracks are pretty serious 4WD. From Door to door this trek was some 450 kilometres and took 15.5 hours. Time to pick up some more winter bonus points. I was keen to activate this one and seeing the WX was looking good for the expected long walk, why not give it a shot? Access is straightforward. Drive through Warburton towards Mt. Donna Buang. Pass the Donna Buang Rd, continuing on the Acheron way (gravel) for 10.5 kilometres. On a tight LH hairpin bend is the junction of # 15 Rd. There is a small parking space nearby. Climb over the gate and climb steadily eastward for 2.5 kilometres to the junction of #10 Rd then north for a further 5 kilometres (steep at first the levels off a bit) I was wondering if I would ever get there! It took me close to 2 hours . Knowing that there were a few activators out and that I was running close to my scheduled time, I set up quickly. I had been monitoring some activity on 146.500 FM which turned out to be Peter VK3PF on VK3/VT-026. A contact ensued as well as coordinating a CW contact with Warren VK3KS / VK3BYD who was with Peter. Peter gave me the heads up with Greg VK8GM and Steve VK8XR on 20 metres SSB from VK8/AL-096. Four contacts and 4 x S2S! In all, I managed 3 further CW contacts on 30 metres followed by 14 on 40 metres SSB. My first contact was at 01:20 hrs utc and the last at 02:21 hrs utc. A bit less than 2 hours back to the car – well it was down hill and I pushed it a bit. By the time I reached the lock gate and attempted to climb over I was pretty spent, falling off the gate at the first attempt. From here it was back to the car and head to Mt Donna Buang! My second activation of this summit, I set up at a picnic table, there not being too many people around in the late afternoon with cold and windy conditions. Scouting around first on 40 metres I soon found Peter VK3PF now on Hyde Hill VK3/VC-008 so started off with another S2S. Three 30 metre CW contacts including warren also S2S on Hyde hill. 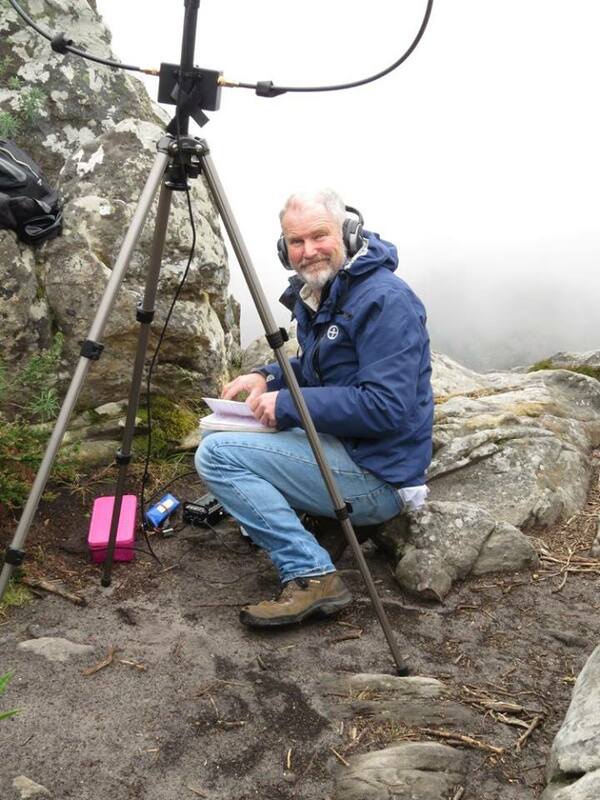 40 metres, a S2S with Rob VK2QR/3 on VK3?VE-165 then 40m CW with the ever reliable Ron VK3AFW. I thought I would have a look at EU long path on 20 metres so spotted myself and put out a call, resulting is a solid contact with OK2PDT then just a couple of local VK3s: a bit early for LP EU perhaps? Back to 40 metres SSB for a few of the regular VK chasers then back to 20 metres CW. Time was now 06:00 hrs UTC, 30 minutes on fron the contact with OK2PDT. Propagation was fairly average and I think still a little early. By this time I was also feeling quite tired and cold. Two further contacts DJ5AV was in the log followed by IK1GPG. My QRS request was ignored so I left it there and had a coffee then packed up. About 45 minutes later on the way home I easily worked Mike 2E0YYY/P. Ron and I live in the same Grid Square (QF22MC) are bot members of the MDRC and trying to get more people involved in Sota CW. Chatting during the week we decided on an activation of the “New” Federation Range near Lake Mountain was in order. This was the last opportunity to pick up a winter bonus plus, as there was no snow, no parking fees at lake Mountain. Driving up to Marysville our plans were thwarted, there being a bicycle event on the Lake mountain rd and it being closed until 11:00 am. As the sign did not indicate an actual date (just Sunday) we thought it could have been left out from the weekend prior. None of the local store holders knew anything about it. In hope, we headed up towards Lake Mountain, only to discover the road was indeed closed until 11:00 AM. What to do? The walk from the carpark is 4 kilometres, mostly all up! This is twice the distance than the “OLD” Fed Range! 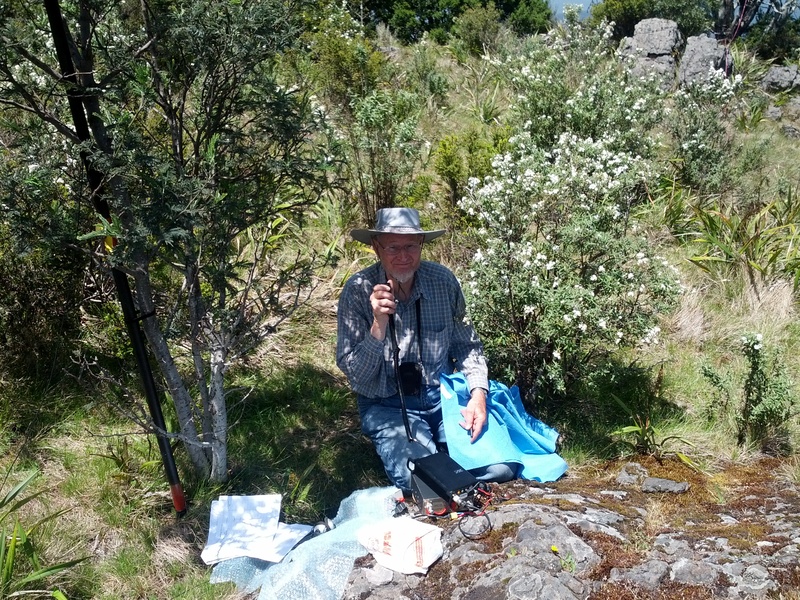 The activation zone is quite broad so Ron set up in a clearing on the lower edge and I set up just below the summit. Nice to work John VK6NU on 20 metres. Activation from 00:29 hrs to 03:57 hrs UTC inclusive of lunch. Nan and I were heading up to Narbethong to stay the night at the Black Spur Inn; a place we had stayed previously and also frequented on our TLCCV trips. 21 contacts all up, qualifying the summit on CW and SSB on 40 and 20 metres. There were also 2 x 30 metre CW contacts in the log. All up, 9 S2s, one VK5 conservation park and DX to VK6 on 20 metres. Phone coverage very patchy, mostly out of range. I have been up to Mt. Strickland many times. The first was in my old Landrover in 1986 when it took 6 hours to climb Strickland Spur. Subsequent trips have used the Spur and Link tracks plus Feiglin Rd (2WD). Strickland Spur Track is a serious 4WD track and the link track is a bit easier but still requiring a competent driver and vehicle. Not recommended for single vehicles. Strickland – See map for Yarra Ranges N.P boundary within the activation zone. I was set up and on air at 05:17 hrs utc. The first hour produced 14 contacts of which all but one were CW. I then tried 20 metres for EU on the long path without any success and by this time the WX was looking ominous. A quick QSY to 40m SSB put another 10 contacts in the log but still nothing on 20 metres albeit I could now hear some weak G stations. With a thunder and lightning storm nearly upon us, it was a quick pack up and then a descent in torrential rain to the welcome warmth of an open fire at the Black Spur Inn. 24 contacts, 11 x SSB & 13 x CW. All on 40 metres. 7 x S2S so quite successful even without the EU contacts. I have driven past the Cathedral Ranges hundreds of times and often thought about Sugarloaf peak. Well today, despite ominous WX and heavy overnight rain, we conquered it. 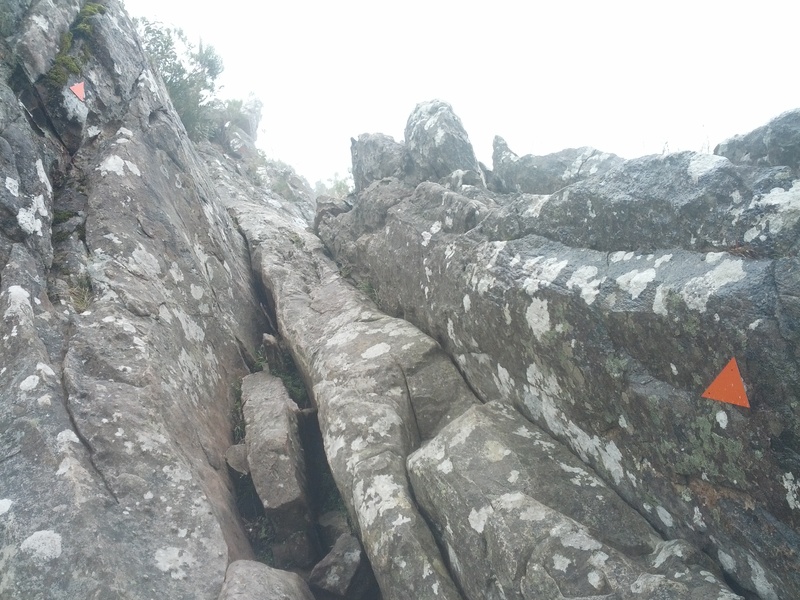 The access track was very slippery in p[laces and took great care. Not one to do if actually raining and with this in mind, we kept a close watch on the weather. The view along the track over the Acheron Valley was stunning at the times when we could see anything through the cloud. Must re-visit in fine weather! I spent quite a bit of time around Noojee Victoria in the late 1970’s and early 80’s with fellow electrical apprentices on camping, trail bike touring and later 4WDing. I had been to Mt. Toorongo many times and had even ridden the full track down to Coupes Road when it was accessible. Lots of changes since then. The track is seasonally closed. There are good views from the fire tower which is located south of the SOTA summit. Ron and I were in the Landcruiser and we had a good run up on the Mt. 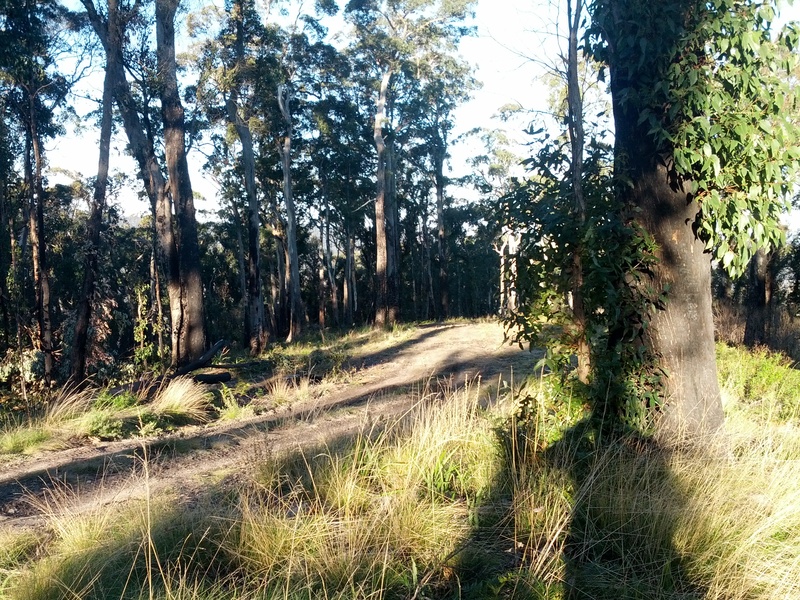 Baw Baw rd towards Tanjil Bren, then the Link Rd, Mundic Rd and finally Mt Toorongo Track. This track is in quite good condition and would be quite suitable for a high clearance 2WD in dry conditions. Watching the GPS, we overshot the exit point from the main road and had to back track to the closest point to the summit on the road and then back a bit further to find a suitable parking spot. 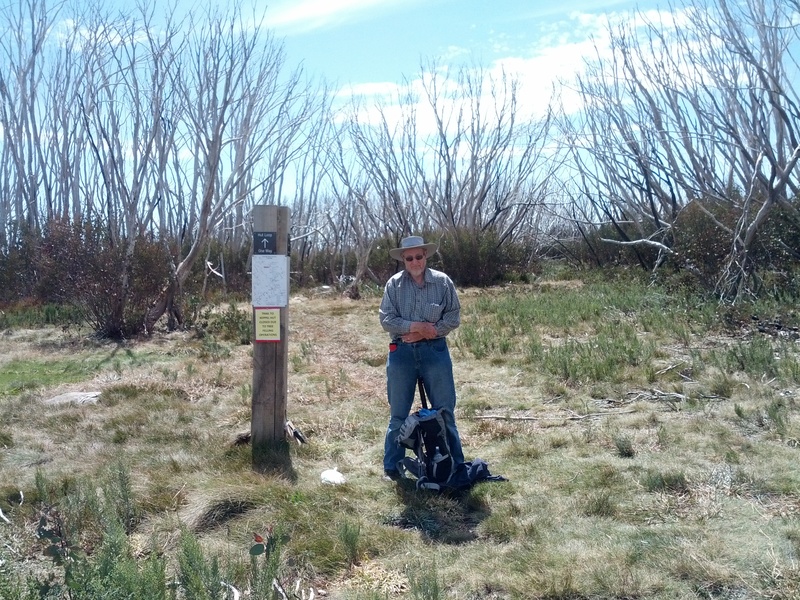 The Mt Toorongo track follows the 1220 metre contour when opposite the SOTA summit location, it appeared we could make the summit prior to UTC roll over, the distance being under 300 metres and only 37 metres vertical or 12 metres to enter the activation zone! This was not to be as the going was slow through thick scrub that had us at times on our hands and knees like wombats burrowing underneath the worst of it. We did eventually make it to the top where there was limited clear space – not really suitable for our two stations. I worked mostly CW and Ron SSB. I did experience significant interference from Ron (running 20 watts I think?) in that my auto tuner was reacting to the close proximity RF and my attenuator also clicking in to protect the front end. In the end I shut down for a while. With a second activation planned for the day, we headed (fell!!!) down a path similar to that we ascended on and, with some extra scrapes and bruises, Went back the way we came and towards Mt. Horsfall. Phone coverage OK on the helipad. Not great at my operating position. Like alot of places, there had been logging in the area, we reached a sort of T intersection where the most used track headed west and towards Mt. Horsfall – which we took only to end up in a logging coup. A quick about face had us on the correct but lesser used track and we were soon on the 40 mile break – it being a nice easy ridge top drive and suitable for an AWD vehicle with reasonable clearance. Ron set up in the large clearing at the summit while I headed further along the main track in order to get some RF space between our two stations. With time getting on, we also had our lunch during the activations. Once again, I stuck mainly to CW with Ron on SSB. A nice summit, plenty of room, must go back and check out the remainder of 40 mile break. We headed out via the ascent route but kept going west along Toorongo Rd, finding our way to the Loch Valley and the Loch Valley Rd direct to Noojee. I feel this route is quicker than the Baw Baw Rd but there is a maze of roads and tracks in the area that also contains a pine plantation.